I’ve enjoyed living in Grande Prairie for more than a quarter century. My wife Mary and I brought up our three boys here and now our two grandchildren are benefitting from all the city has to offer. In my small way, I have always found opportunities to give back to the community. Now retired, it’s time for me to step up and serve in a bigger way. I was on the Grande Prairie Public School Board for 12 years, 5 as chairman. I also served as a public member of the Grande Prairie Airport Commission, and on the city’s Community Enhancement Advisory Committee. Grande Prairie needs to be a city that attracts and keeps professionals, tradespeople, and others who will contribute to everyday living in our community and make it a great place to live, work and play. That means continuing to enhance and add to the amenities, facilities and services that meet the needs of those who live here, and the expectations of those willing to move here. We’re coming out of a rough economy, and our spending resources are limited. However, with careful and thoughtful planning, we will continue to develop in ways that make Grande Prairie thrive. 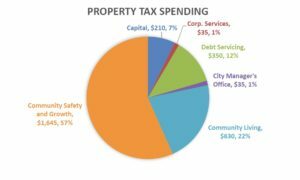 The city budget is large and complex. The priorities we set are the result of ever-changing factors, most of which will be revealed to me on the steep learning curve I hope to experience over the next several months! I note that a majority of the budget goes towards Community Safety and Growth; I believe that is the right area on which to be focussing our spending. I’m encouraged by council’s advocacy for police funding and affordable housing strategies I’m also happy to see the introduction of a 10-year master transit plan. I appreciate the work being done now to prepare us for successful inter-municipal collaboration. Crime and public safety – I believe we need to continue to enhance our law enforcement forces, and I appreciate the collaboration between RCMP and bylaw enforcement. Taxes – We may have the highest property taxes in the province. The issue is not one of over-spending, but the lack of a broad and diverse tax base. I truly believe that we provide the services that one would expect from the city the size of ours, so cutting costs would likely result in changes our citizens would not appreciate. We need to find new revenue sources. That’s one reason why I look forward to partnerships with our neighbouring municipalities. Economic Growth – We are well placed to handle the rapid growth ahead of us. The oil and gas industry in our part of the province promises to thrive and we have a track record of sound planning that will allow us to accommodate residential and business growth. I conduct myself with integrity and commitment. I never go into a debate with my mind made up, and I am prepared to learn and understand all perspectives that might have an influence on making the right decision. I do my homework, and I prepare myself to meet the challenges of each day. This city has served me and my family well for more than a quarter century. In gratitude, I’m committed to giving back to the community. I want this to be a place where I will be proud to have my grandchildren grow up and thrive. All these things lead me to serving you well during my time on council.